A privileged environment, in the finest part of Burgundy Climats, a UNESCO World Heritage site is the place where you will find this wonderful establishment of nature. Old and traditional buildings with the well in the reception cellar, or the stairs of la Perrière with it ramp that has been carved out of a wood log will welcome you in a traditional architecture. Ideally placed between DIjon and Beaune, this is the best spot to start many hiking and cycling tours. The Hotel de Vougeot have sixteen rooms placed in three buildings. This way you are independant during your stay. Three categories of rooms, all equipped of bathroom with showers, toilet, TV and mini bars. Many of them have a view over the Clos vougeot and Côte de Nuits vineyards. Hot drinks (tea and coffee) are available for everyone in the entry “la Perrière”. 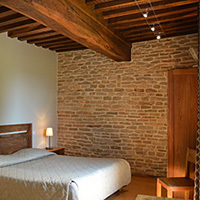 For the Commercials and VRP, we propose you a promotion for a one night stay at 82 euros (classic rooms). And 103 euros in the luxury rooms, in addition with restaurants or home made meal (cold and served in your room). Compostelle Pilgrims: 70 euros the room and buffet breakfast for 1 person. or 90 euros for 2. Not available between May 01st and October 31 : 80 euros (1 person) and 100 euros (2).